I've been ill - nothing major just a stupid virus but enough to put me out of action for a few days. Now this shouldn't have been a real problem. A couple of days with my feet up, watching T.V. and catching up on some reading. I flew into a semi-psychotic rage, at myself I hasten to add, well actually at my body for daring to let me down just when I had got both the kids back to school after a long and tedious summer holiday (mostly filled with hospital stays). then, I got ill - Way to go Sars!! Suddenly I found myself back on the very same settee that I had been sitting on taking care of my son for years. "this is the perfect opportunity to get some of those small to-do jobs done" it wittered on. I chose to watch the shows I'd got recorded on the 'tv box thingy'. Now, is this just me, but have you realised too, that if you haven't watched something you've recorded within 2 weeks then you probably didn't really want to watch it in the first place? Next on the list then was 'cleaning the computer '. As if I don't have enough to bloody clean. What with myself, the house, the car, the kids and the rabbit, now the bloody computer wants in on the act! Still, I logged on and tried to delete some old programs and files in the tiny hope that this would speed the damn thing up a bit. In the computers defense it is a little out of date. I mean, I know nowadays a 'tower' is the equivalent to a zimmer frame and incontinence knickers for humans, but I do like the old thing. Eventually, I gave up on the computer and thought 'Ive got to have achieved something today' so I decide to defrost the freezer. It was a bit over due, I'd had it over 3 years and last defrosted it ......em? So I began throwing out the old food. There was so much lose veg in the drawers I could have made a casserole, but no, that hit the bin. Closely followed by over half a drawer full of various flavours of ice lollies that obviously the kids didn't like. Nearer to the back of the freezer I found some tupperwares. After I eventually prized the lids off with a knife (I was so not in the mood for this) it was a bit of a shock. I didn't remember even cooking a meal that looked like that, let alone saving a portion. 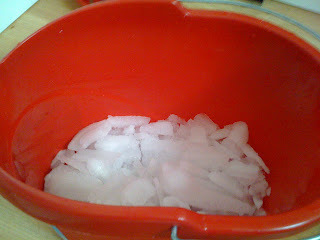 When I eventually finished I had a rather impressive bucket of ice. The last time I saw that much ice it had a bottle of champagne nestled in the middle of it.